Electronic UV Sterilizer Ballasts; Lamp Problems . While I have considerable experience using ballasts, both Magnetic and Electronic in Ultraviolet Sterilizer as well as aquarium lighting, I am NOT an expert in the exact workings of a ballast, so my explanations are based on my experience in use, research, and consulting with others in the profession. Hopefully my explanations will be helpful in understanding. Electronic ballasts contain semiconductors and other electronic components. Electronic ballasts are similar to the switching power supplies you find in computers, creating a 'chopped' electrical current with up to 50,000 pulses of electricity supplied to the lamp with the inductor along with the capacitor smoothing out the voltage or current. The incoming 50/60 Hz power (115 or 230 volts) is converted to high-frequency AC. This leads to a constant gas discharge compared to conventional ballasts and prevents cathode flicker. Unlike a magnetic ballast that uses a starter to provide the correct "surge" voltage to light the lamp/bulb, the electronic ballast utilizes this electronic circuitry to provide the correct "surge" voltage to light the lamp/bulb, generally over 350 volts (and often MUCH more for some lamps). What is noteworthy is that the same Electronic (or Magnetic) Ballast that can fire an 18 watt True Hot Cathode UV-C Bulb can fire, an 18 Watt Cold Cathode UV bulb, or often a 15 watt T5 cool white bulb/lamp (I am using an 18 watt as an example). The difference is that high output lamps such as a Hot Cathode low pressure "TRUE" UV-C Bulb requires a higher "surge" voltage to remain consistent to light the UV-C Bulb unlike a cold cathode or an older, mostly 'expired' UVC bulb. As a lamp ages or in case of cold cathode lamps it requires less of this "surge" voltage to 'light', so a degraded ballast may continue to work for these lamps, BUT NOT for a new hot cathode lamp. What is also noteworthy is that a ballast that is designed to run on 220V will fire the same lamp as a ballast designed to run on 110V or vice versa. What this means, as an example a 9 Watt UVC Bulb can run on a ballast designed for a 9 Watt lamp/bulb whether it is 110V or 220V. "Ballast operates the bulb. Therefore, the question relates to the ballast only." All this simply means is the socket can accommodate up to a 75 Watt lamp and up to 250 volts, which as per voltage I have already pointed out the fallacy of thinking that a UV bulb/lamp cannot run on both 110/120V systems and 220/240V systems. Electronic ballasts are more efficient than magnetic ballasts in converting input power to the proper lamp power. The operation of UV-lamps at higher frequencies reduce end losses, resulting in an overall lamp-ballast system efficiency increase of 15% to 20%. Electronic ballasts are directly interchangeable with magnetic ballasts. They operate with most UV-lamps available and have a much wider range of lamp wattages they can light. Electronic ballasts have a further advantage in that they are virtually silent. They do not produce that low frequency "hum" produced by magnetic ballast fixture. Electronic Ballasts are more compact and light. 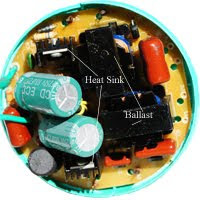 HOWEVER Electronic Ballasts have their failings, this includes poor heat sinks that allow over heating of electronic components over time with the end result being over voltages or under voltages that cannot light new lamps (while often lighting older lamps) or literally 'blowing' lamps due to over voltages. Poor quality electronic components are a common problem especially with low end brands such as Jebo. Moisture/Humidity is another factor that is damaging to electronic ballasts, again especially poor made electronic ballasts where the components are more susceptible to moisture and humidity. A lack of understanding about even the most basic fundamentals of how an electronic ballast works has resulted in many rude phone calls and emails to my colleagues and I. The most common reason for True UV-C Bulb failure is NOT the lamp/bulb, rather it IS the ballast. As I noted earlier in this post/article, many ballasts are of poor design such as poorly designed heat sinks (often weak solders too), that can cause failure of the electronic circuitry that controls the correct "surge" voltage to light the lamp/bulb. This results in a new Hot Cathode UV-C bulb not being able to fire while an older Hot Cathode UV-C Bulb OR an easy start cold cathode UV bulb (which is not a full UVC bulb) still often firing. What is also noteworthy for any reader wondering why not then use a cold cathode UV light bulb, is that these bulbs only produce 7% necessary UVC lighting energy for actual UV Sterilization. Compare this to the 38% UV-C at 254nm that a hot cathode UV Bulb. Obviously a UV Sterilizer run with a cold cathode UV bulb which is becoming more common with eBay, Amazon and other discount websites selling low output UV Bulbs is basically turning your UV Sterilizer into a pretty blue light machine that does NO level 1 Sterilization. Moisture or humidity damage can also result in UV-C Lamp failure, often resulting in blown bulbs (which again results in miss-placed blame by many who do not understand how or what the electronic ballast performs. Moisture/humidity damage is generally the enemy of any UV Sterilizer used near a pond or aquarium, but good care of protecting the unit from any direct or even indirect moisture can go a long ways in ballast lifespan (this includes UV Sterilizers/ Clarifiers designed for outdoor pond use). Poor component design is much more difficult to prevent damage other than keep your electronic ballast in cool well ventilated location (which is often difficult for ballasts that are built into a UV Sterilizer such as the Pondmaster UV). However even UV Sterilizers with separate electronic ballasts can have these issues, with the Coralife Turbo Twist suffering from early electronic ballast failure (based on my use and other colleagues experience), with their 18 watt model seeming to bear the brunt of these problems. Should you ballast fail to light your new UV-C Bulb or "blow" an existing lamp/bulb, replacement is often expensive or even impossible for many UV Sterilizers. However as noted earlier, a ballast is a ballast and you can replace your existing electronic ballast with that of one made for another UV unit of the same or very close wattage. Also if you are of reasonable DIY skills, a magnetic ballast (along with a starter) can often be purchased at local hardware stores and swapped out (this may take a bit of time though). Sometimes it is more simple & economical (especially when one considers the value of their time) to replace your tired UV Sterilizer with a new model; in this case I strongly urge readers to consider the TMC Line of UV Sterilizers (out of Europe) which are very well built and yet reasonably priced often less than some other so-called name brands and clearly superior in performance and durability over most available UV Sterilizers at any price.